Maria Arseniuk has two graduate degrees, one in Women’s Studies and another in Public Affairs and Political Science, and she is an entrepreneur, artist, advocate for equality and social justice, feminist and creator. She started Femmebroidery, an online, Calgary based company with an international audience. It’s aim? To push the limits and get people thinking about women’s rights, social justice, wisdom and popular culture. In Instagram’s true nature, I came across an amazing piece of Arseniuk’s and connected with her on Etsy. 1. When did you realize you wanted to start your own business? Hmm, wow – you know, I don’t think I started thinking of it as running my own business until very recently, maybe a couple of months ago when I did my first Market Collective here in Calgary over the holidays in December. It was then that I kind of thought to myself, you know I could see myself doing this full time. Before that I saw Femmebroidery as a way to earn some extra income while waitressing and looking for work more in my field, but it was at Market Collective, surrounded by so much creative talent, that I really began to consider what I was doing a business. 2. You went to school for Women’s Studies – where did you study and why was a post-secondary degree in Women’s Studies so important for you to achieve? First, I was and still am incredibly passionate about social justice. I wanted to learn more about the kinds of things I was reading about in the media and researching for myself online. I wanted to have the language to describe the things I was living and the experiences my friends were living when we didn’t have the tools to call out discrimination and systemic injustice for what it was. Second, it was a continuation of my first graduate degree, in which I had written my thesis on social welfare benefits for single mothers. Although this fell under the umbrella of Public Affairs and Political Science, I became really in tune with the specific ways in which women face oppression and I was interested in pursuing this further. I had also hoped to teach at a post-secondary level, which is why I started a PhD, but ultimately I became disenchanted with academia and did an MA instead. 3. You started Femmebroidery as you were writing your dissertation – this must have been a really busy time. What made you want to start selling your artwork? It was a really busy time! And that’s exactly why I started it then. It was a creative outlet to distract myself from the everyday demands of graduate school. I didn’t even consider selling embroideries – at the time I was making them as gifts for friends. It wasn’t until a friend suggested I start an Etsy store (and even then I laughed off the idea) that I really began to consider the idea of selling my embroideries. And even then, I still envisioned it as “just” a hobby. 4. What is your main goal with Femmebroidery? My main goal is to create quality, radical, independent art! 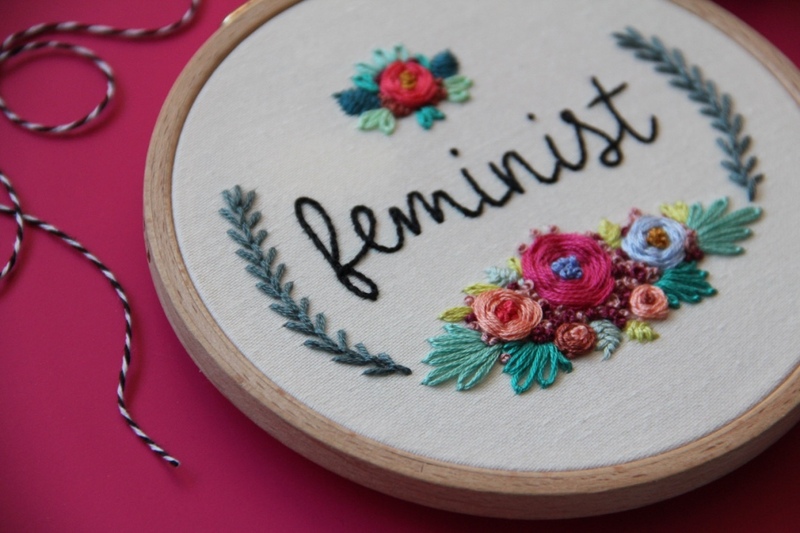 A huge aspect of Femmebroidery is feminism (hence the name) and social justice. As I’ve grown as an artist, and as the business has taken off the ground I’ve expanded to include other themes based on things I love such as animals and wildlife, but the foundation of femmebroidery will always be to create politically aware pieces that force us to examine privilege, oppression and (in)equality. With the pet portraits that I’ve recently been doing (with the help of my super supportive partner, Leo), my goal is to create a piece of art that is really special for the client. I think human/pet relationships are beautiful, and for the pieces that are commemorative I think it’s especially important to create something that captures the essence of the animal that can be a keepsake for their owner as a reminder of that life. 5. What has been the most rewarding aspect of this journey so far? The most rewarding aspect has been the incredibly positive feedback I’ve gotten! The online makers’ community, especially Instagram, is really awesome. It’s a fantastic experience to collaborate with other artists to do things like giveaways or contests. It’s really humbling to be a part of makers’ markets and to have my hoops in local stores here in Calgary. And of course, it’s wonderful to be able to support myself financially doing something I love. There is that old adage, “Do what you love and love what you do,” which of course is steeped in privilege, because how many people can realistically afford to do what they love (hello bills, mortgage, groceries), so I am incredibly lucky to be a part of this movement. 6. Is there anything you would change about your experiences with Femmebroidery? 7. Who taught you to embroider? Self taught! A friend of my mother’s gave me a book of stitches in 1999 and I’ve been experimenting with yarn and fabric ever since. 8. What’s your favourite place to find inspiration? Why? Definitely current events. And my partner. He’s really good at inspiring me to do more. But I do a lot of work that is related to the kinds of things that are going in our world at the moment. During the Trayvon Martin case I began embroidering “Black Lives Matter,” during the most recent refugee crisis I did, “Refugees Welcome.” Now, during an animal rights protest I’m going to do, “Poach Eggs, Not Lions” (that one, though, I can’t take credit for – Leo thought that one up). 9. Located in Calgary, you have an Etsy store. How does e-commerce benefit your company? Sales? I love Etsy. It allows you to connect with like-minded buyers (and sellers too since I buy a lot of my supplies from Japan and the United States). It opens up an entire market that you previously would not have had access to. In terms of sales -majority of my sales are from repeat customers on Etsy and the majority of those (I’d say 90 per cent) are Americans. 10. Would you ever open up your own studio? Why? I would, but I would love to have it be a part of my home. Leo and I are hoping to eventually buy some land and build a yurt. I would like to have studio as a place where I can create in solitude and be surrounded by all the art I love. Right now, my studio is our craft table (translation: rarely used dining room table) and the patio when the weather is nice. It would be really lovely to have a space all my own. 11. How do you get the message out there about your product besides Etsy? I use Instagram as my main platform and I’ve found it to be really useful because hashtags allow you to connect with people from around the world. It’s also a great venue to broadcast new inventory, sales and local events. I opened my Etsy store last December but didn’t start an Instagram account for it until nine months later, this past September, and what a shame I waited so long! 12. What role does social media play in Femmebroidery’s success? Huge! Hashtags connect my pieces with the people looking for these exact themes. 13. What’s one piece of advice you would offer fellow entrepreneurs? Just keep at it. There will be slow days, weeks, maybe even months but there are few things that beat the daily grind and this is certainly one of them. 14. What are your hopes for Femmebroidery over the next five years? Oh! That’s a big one. I’d like to build an empire ;)! But seriously, if I can get it to a place where it’s my sole source of income, I’ll consider that a success. 15. What do you do when you’re not working on Femmebroidery? I like to write about issues of social justice. You can find my articles in the magazines Antidote and Shameless (available online). I also love photography, travel (50 countries and counting) and food. Definitely food. For more information about Femmebroidery, visit the brand’s Etsy page. Arseniuk said she’s always willing to put in custom orders! Drop her a line, say hello!